Christine Hartmann's Wild At Hearts series (Books 1-3) includes: Wild Within, Paradise Wild and Wild Card. The first book I read out of this series was Wild Card. Wild Card is the third book in the series. This is classified as a romantic comedy and I would certainly agree. The author did a nice job adding some comedic conversation points between characters throughout the story to give it a nice rounded edge to it. I had not previously read the other books in this series and I don't feel that I lost anything from not reading those. However, as with any series, it is nice to read the books in order to gain some back story to other characters that may appear throughout the series to give a broader view. In Wild Card, the story starts off on one track and at some point a detour or various other paths come into play with the story not ending in any way you could initially had anticipated. I liked that the author kept the reader on their toes throughout the story. I liked Bree's character, but at times, I felt she was a little naive. By the end of the story, I liked the outcome and how the author laid out the groundwork to get to that finale we so anxiously await. I am thrilled that I went back to read the first two stories of the series. In Paradise Wild, the author has shifted to a romantic suspense theme/undertone. I found this particular story to be quite inciting and different after reading the third book of the series. This features Ellie who is not the luckiest. Despite this, fate seems to be throwing a line that it keeps attempting to reel her in with. Christine Hartmann did an outstanding job in this particular book with the characters and the story that she created to tie them together and create a story that would leave readers thirsty for more from this author. 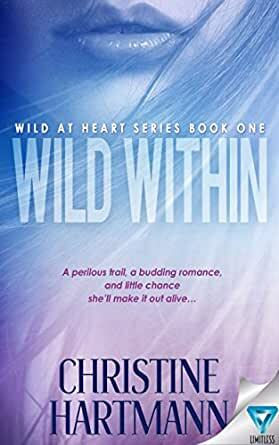 In Wild Within, the first in the series, is another romantic suspense which certainly set a great pace for the series to start. I will admit that I read this series in a non-traditional order, but in the way the author wrote, the stories can each be held apart from the others - yet together, they are even better. Back to Wild Within, Grace is an amazing female lead in the story. Christine Hartmann has a particular talent in her character creation and the depth that is described for each, marks of a talented author. Overall, I enjoyed this series and it's a great boxset!! Grace decides to fulfill her deceased brother's dream to hike the PCT, as a way to honor and remember him. ot also helps her deal with her grief and feel she can move forward with her life. one true love, to term it romantically. This was an entertaining, suspenseful read, however, I’m not sure about the romance aspect. I feel like if it were going to be included in the story the relationship between Grace and Gus should have been better developed. It really wasn’t a necessary part of the story and it seems three encounters with someone is not enough to call it an HEA. A real page turner with engaging characters, a great plot, terrific detail of all sorts, and a wonderful feel for thru-hiking the Pacific Crest Trail. Well chosen title, that promises an enticing mix of romance, internal strength and self discovery. Hartmann delivers! An offer for the movie rights should not be long coming. The tragedy that Grace and her family faces in the beginning of the book is heartbreaking. I enjoyed going on Graces journey with her as she moves through her grief and finds herself on the adventure of her life, one that almost takes her life more than once. The story has plenty of adventure, romance and suspense! Loved it and can't wait for book 2!